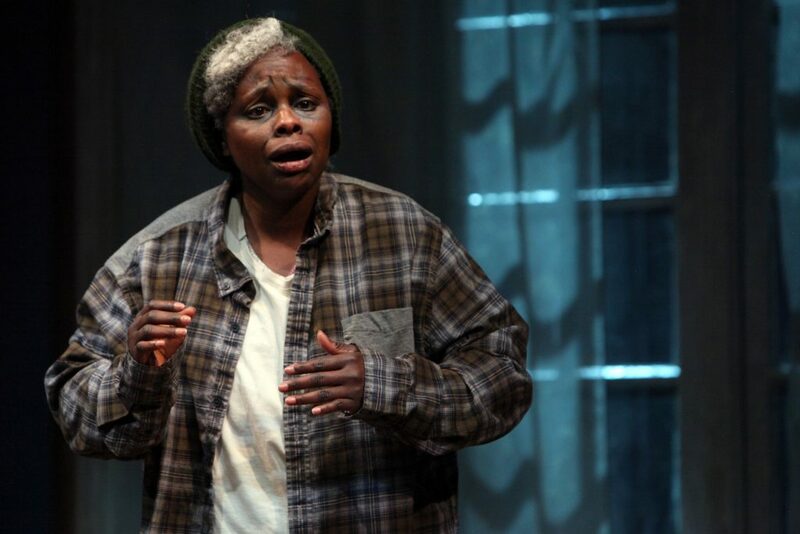 “In Old Age” by Mfoniso Udofia, the fifth installment of her Ufot family cycle, is having its world premiere at Magic Theatre. Udofia reminds us of the power of healing and the necessity of letting go—even in old age. Abasiama Ekpeyoung (stoic Nancy Moricette), a first generation Nigerian woman, is older now, and plans to live out her life in a massive, crumbling New England house. 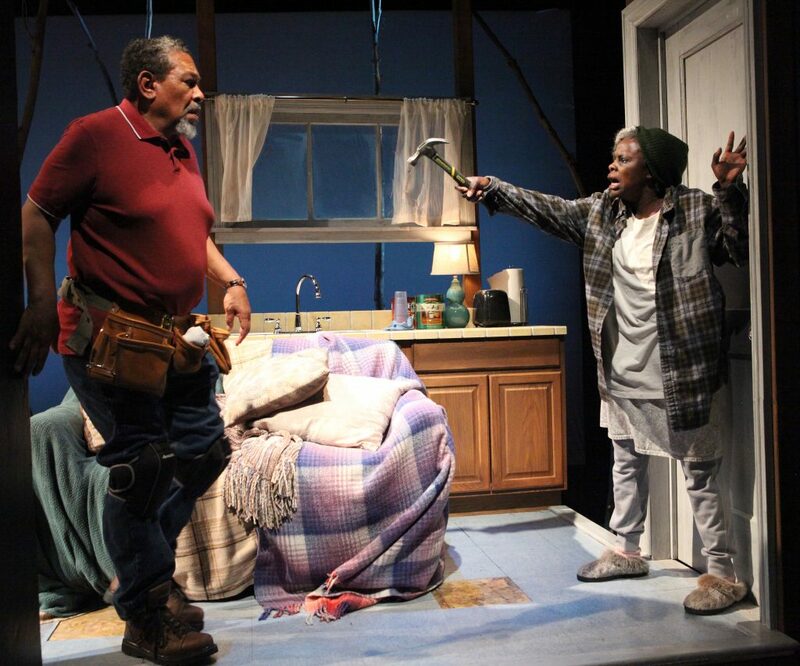 But she is rudely awakened by the knocking of repairman Azell Abernathy (powerful Steven Anthony Jones). Her children have paid Azell to replace the old, creaky floorboards. Abasiama’s house is the definition of decay, the raggedy couch she sleeps on has no legs, her T.V. is a technological dinosaur. She even carries an old frayed blanket with her. Abasiama mirrors the house’s dilapidated walls with her outdated clothes and failing abilities. 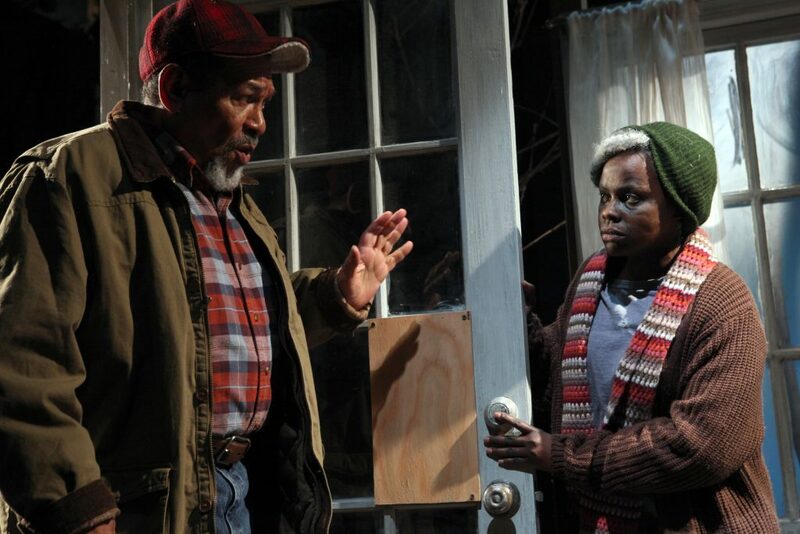 Set and Light Designers Andrew Boyce and York Kennedy create a vacant mystical atmosphere, as the two characters begin to build a bit of respect. We see these two souls connect on a wordless, spiritual way. They begin to unravel their difficult past lives. Abasiama and Azell come from opposing origins and cultures. She’s traditional Nigerian and he’s a southerner from Alabama. They get into sharp quarrels, attacking with emotions, accusations, and even a hammer! Abasiama, a sullen, quiet widow, is prone to bouts of staring into no man’s land. Abasiama repeatedly asks Azell, “What kind of man are you?” But Azell seems incapable of staying quiet: he constantly makes small talk. But the repair guy charms the hell out of us with his upfront nature, good humor, and peppery cuss words. Outside Abasiama’s window, two charred, frail trees grasp at the house—providing her only connection to the world. The house is haunted and Amasiama, herself, is a witch of sorts—with her Nigerian background rooted in spirituality. Abasiama gains the strength to uproot her late husband’s leftovers. She tosses out clothes, boxes, and an uprooted tree into the stormy night. Her rebirth moves me—just by seeing her let go and start over. She is planting anew. 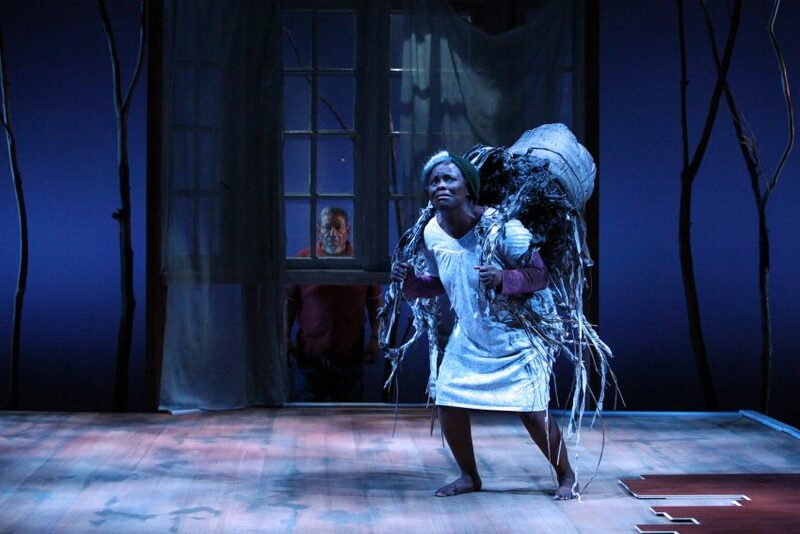 Udofia creates a house of spirits where Abasima realizes she needs to let go in order to blossom, once more. As Azell gradually remodels, the widow grows into the present. 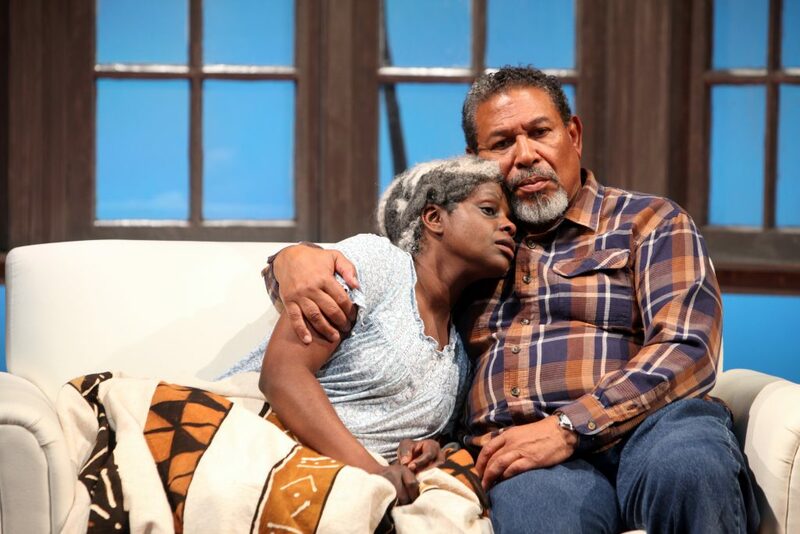 Removing the past, playwright Udofia shows us that flourishing is possible at any age. Cast: Nancy Moricette and Steven Anthony Jones.